There are various kinds of tubes on the market, some of them are cost-effective and some are beautiful. However, I want to introduce a lamp that is both cost-effective and beautiful-360 degree led t8 tube light. There are various kinds of tubes on the market, some of them are cost-effective and some are beautiful. However, I want to introduce a lamp that is both cost-effective and beautiful – 360 degree led t8 tube light. Smooth and white outer shell, simple and generous appearance, led T8 waterproof tube adopts new nanotechnology PC as tube body material, which is able to catch your attention at a glance. A) 360-degree omni directional lighting can best meet your lighting needs. B) 96% of the optical transmission ratio, which affects the luminous efficiency and excellent heat dissipation effect. 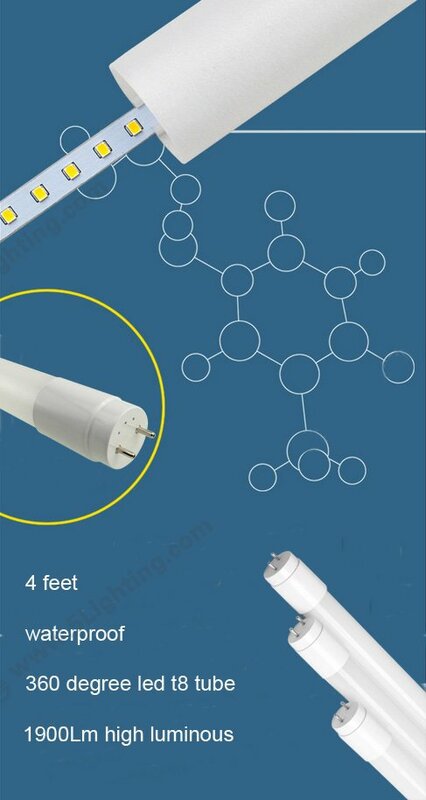 C) Using 2835 led light as lighting source can emit 1900 Lumens high luminous light. D) Shatterproof and waterproof, it is not easy to bend or deform. E) Easy to install, plug in and start working. T8 shatterproof tube has much application, you can use in Office, Meeting room, Shopping mall, cabinet, Dormitory, Corridor, Subway and so on. Our 360° and waterproof led T8 tube to globe market, We have full of confident to meet your quality level.